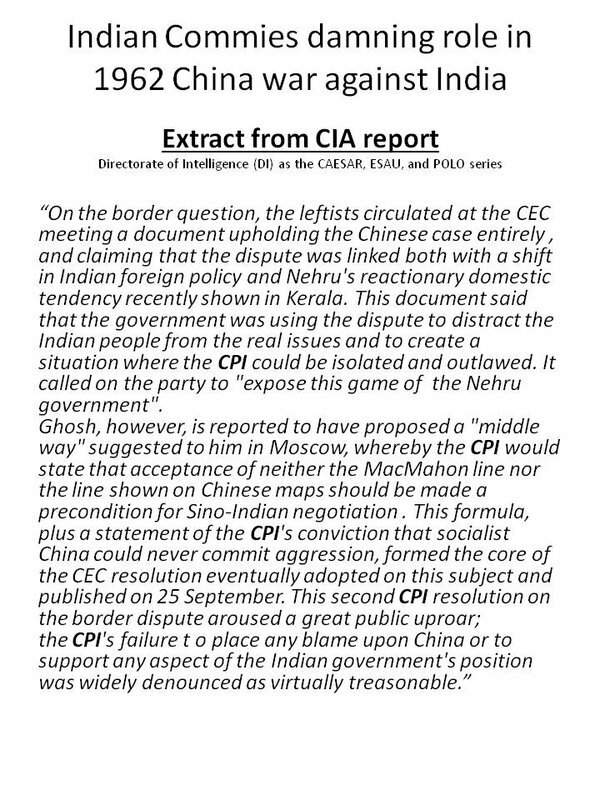 Whether it was E.M.S Namboodiripad or Harkishen Singh Surjeet then or Sitaram Yechury now, it comes as no surprise to listen to Communists praising Pakistan or China. 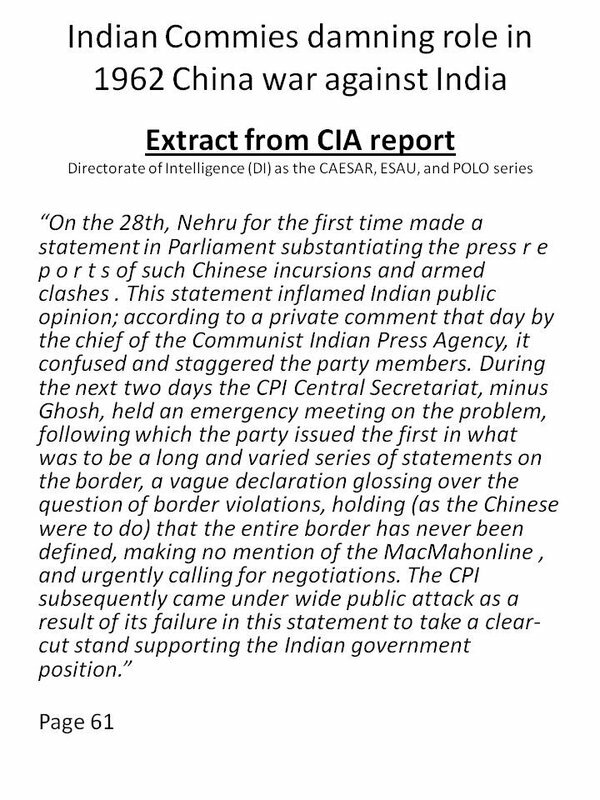 During 1962 India-China war, EMS said, “…the Chinese had entered territory that they thought was theirs and hence there was no question of aggression. At the same time, the Indians were defending territory that they considered theirs and so they were not committing aggression either…” . 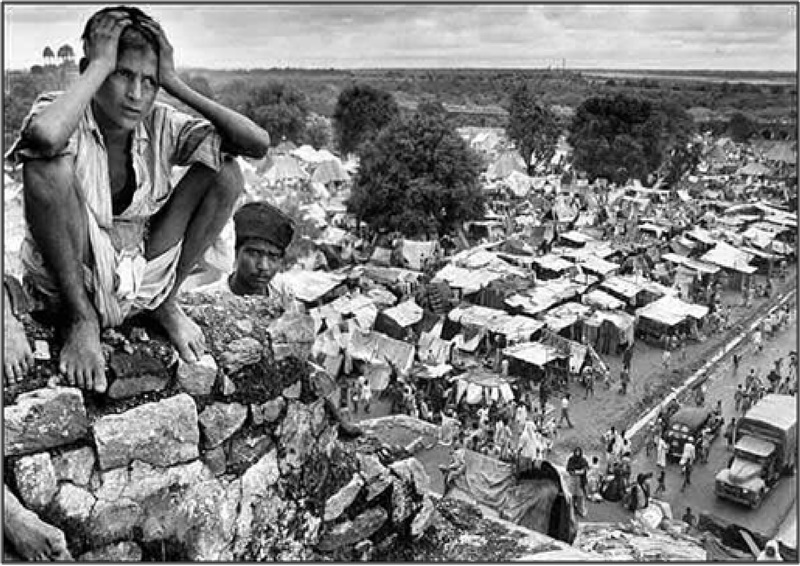 In 1998, the general secretary of CPI(M), Harkishen Singh Surjeet reiterated the position of E.M.S on the issues of border conflicts. 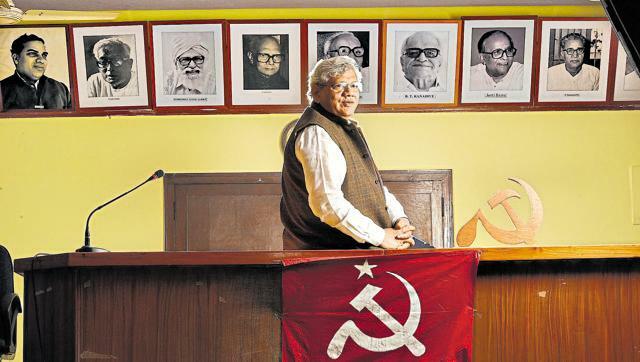 Now, Sitaram Yechury, General Secretary of Communist Party of India (Marxist) says, what is wrong in saying ‘Pakistan Zindabad’. There is a confluence of Hate Hinduism brigade today. Some openly talk of breaking India, and their right to do so is defended by others on grounds of “freedom of expression (FOE)”. Make no mistake, this is only a ‘good cop, bad cop’ routine. The agenda that unites them is Hate Hinduism. Communists supply the ideological and moral leadership, the media and westernised intelligentsia multiply the firepower, and the Congressis and others provide cannon fodder. What is happening today is not idle chatter. It resonates with the tragic history of India. 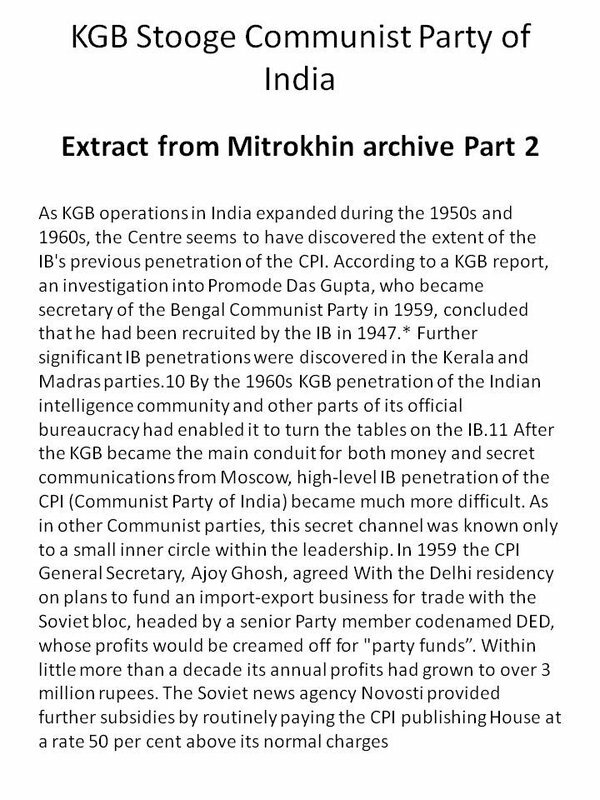 An aspect of its history that is deliberately hidden by communist historians, who control the history writing – How the communists have helped to break India. PAKISTAN DEMAND MADE MUSLIM LEAGUE ANTI IMPERIALIST ! Oppression! Exploitation! In their name, destroy the country! Does anyone find echoes of ‘ham kya mange azadi’ here? The problem with Pakistan demand was that Muslim League was not a mass organisation, since aristocrats and vested interests had important positions in it. The communists decided to change things at the ground level, by building the Muslim League wherever needed. 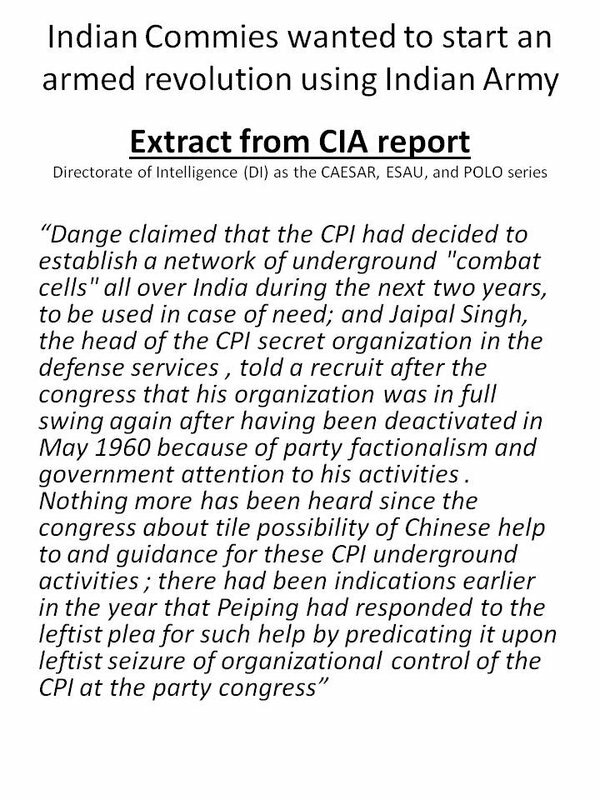 Daniyal Latifi was a well-known Indian communist who gave up his lucrative practice at Lahore to join the Communist Party as a fulltime worker. He later joined the Punjab AIML and became its active member. Does anybody find echoes in what is happening with the Kashmiri separatists today? PAKISTAN DEMAND REVOLUTIONARY, AKANDA BHARAT SEPARATIST! Communist perversion reached its logical limit when they characterised Pakistan demand as nationalist and anti imperialist, while Akhanda Bharat slogan was called separatist! 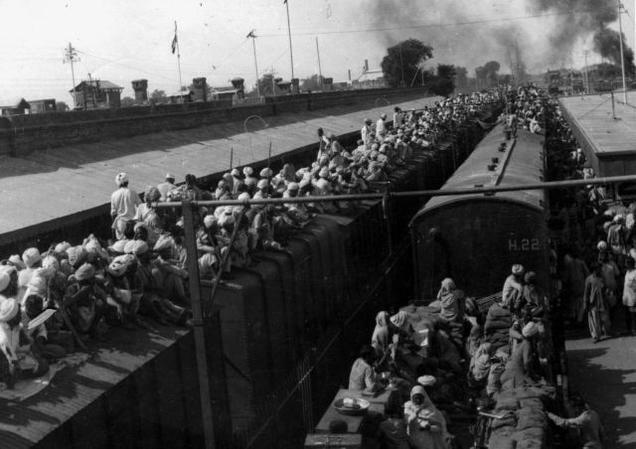 While supporting the Pakistan demand in official documents, Sri Adhikari writes “We saw in the growth of the Muslim League not the growth of communalism but the rise of anti-imperialist consciousness among the Muslim masses…”. In this way was the banner of Pakistan unfurled by the communists in India. They attacked, delegitimised, and isolated the nationalists of India and helped to break India. WHAT WAS THE RESULT OF COMMUNIST ACTIONS? 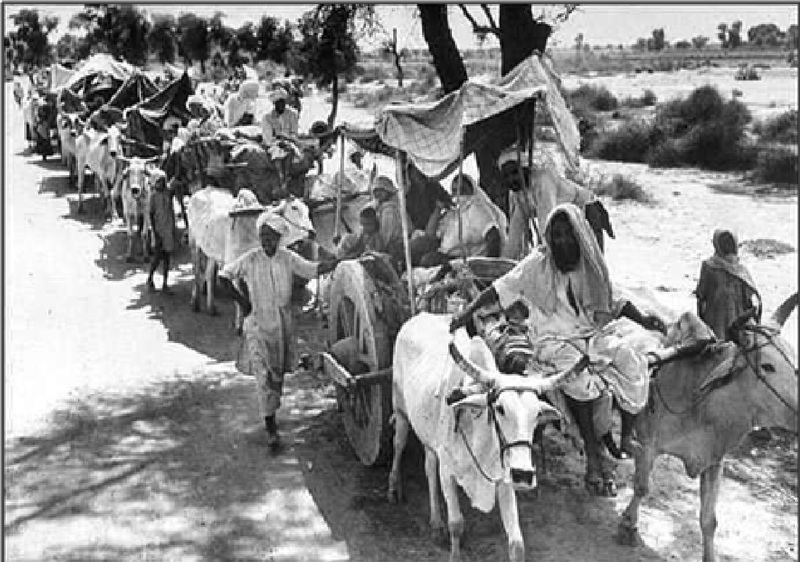 According to Ram Manohar Lohia the Communist support to the partition demand “acted like an incubator,”  meaning that the seeds of Pakistan were nursed to ripeness in Communism. Those who tend to dismiss nationalist concerns at what is happening today as ‘alarmist’ would do well to study how Pakistani muslims today assess the contribution of communists in those days. 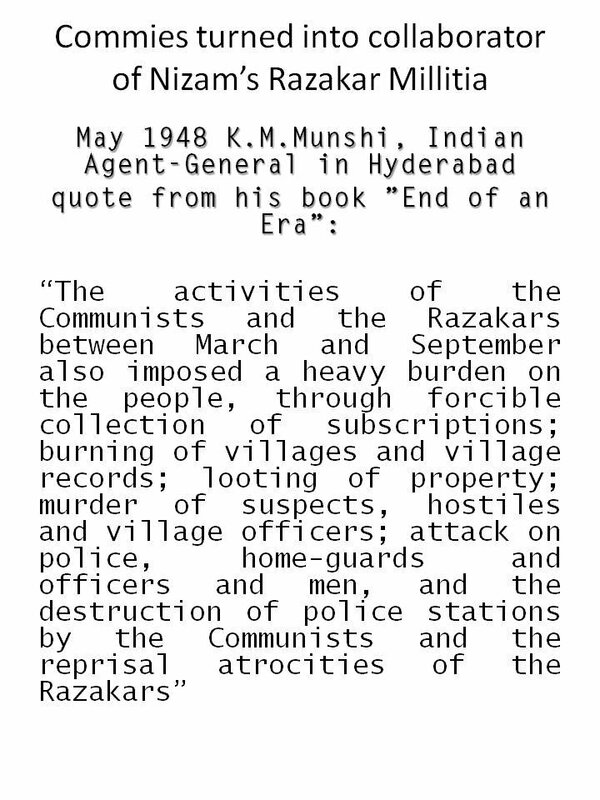 When the communists led by Sajjad Zaheer went to Pakistan to collect their wages of sin, they met with bitter disappointment. Even earlier, communists and their supporters were denied tickets and formal positions in the party by the Muslim League, and the League manipulated things to its own advantage [pp 570-1, 6]. The wages of sin were paid in blood by the Pakistanis. The same has happened to communists in Iran, East Pakistan, and all other Islamic states. When will they understand that no amount of idealism can justify long lasting lunacy and betrayal of nationalism? Why this lunacy? Most communists are not born idiots. One can only infer that they are blinded by hate. Hatred for Hinduism. Hatred is destructive. Love for the motherland should supplant hatred in the human soul. That alone is the way forward. 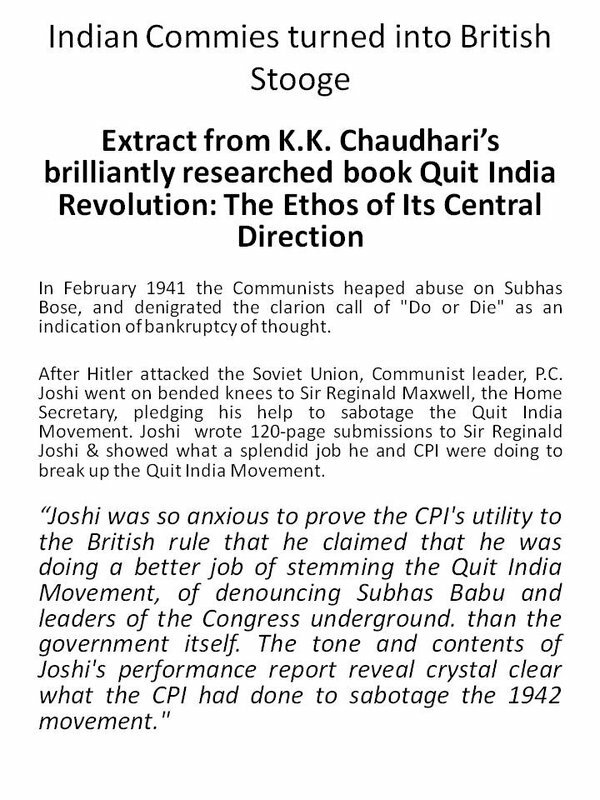 PC Joshi Congress and the Communists, People’s Publishing House Bombay, p 5. 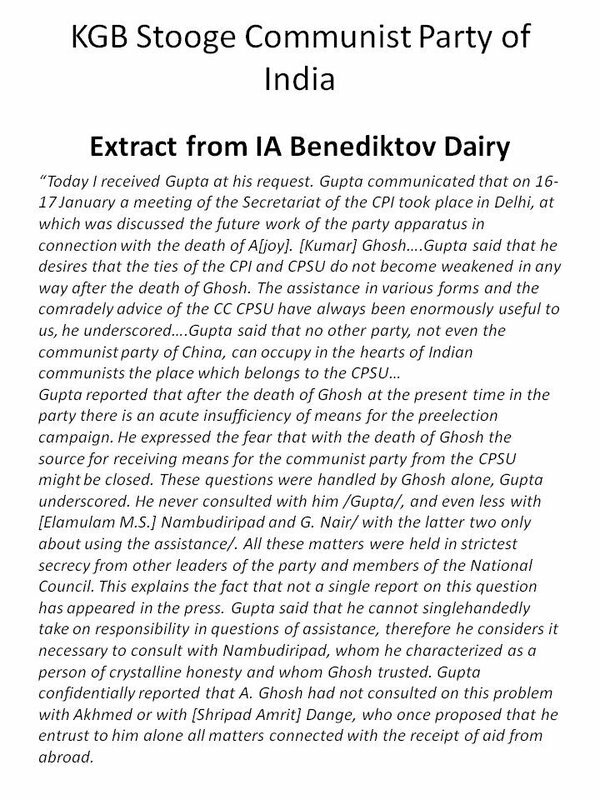 G. Adhikari, Report to CC, on Pakistan and National Unity, Communist Party of India. “Communists in a Muslim Land: Cultural Debates in Pakistan’s Early Years” Kamran Asdar Ali, Modern Asian Studies, 45, pp 501-¬534, 2011. “The Guilty Men of India’s Partition”, Ram Manohar Lohia. His full interview with Karan Thapar is here. The Story of a GREAT BETRAYAL, a blog post. 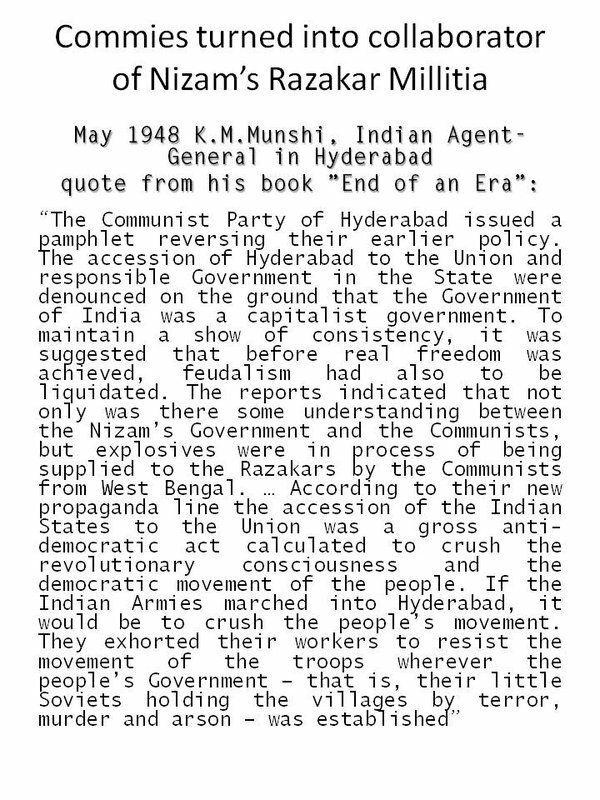 K M Munshi the Indian representative to Nizam, wrote about Commie Betrayal. 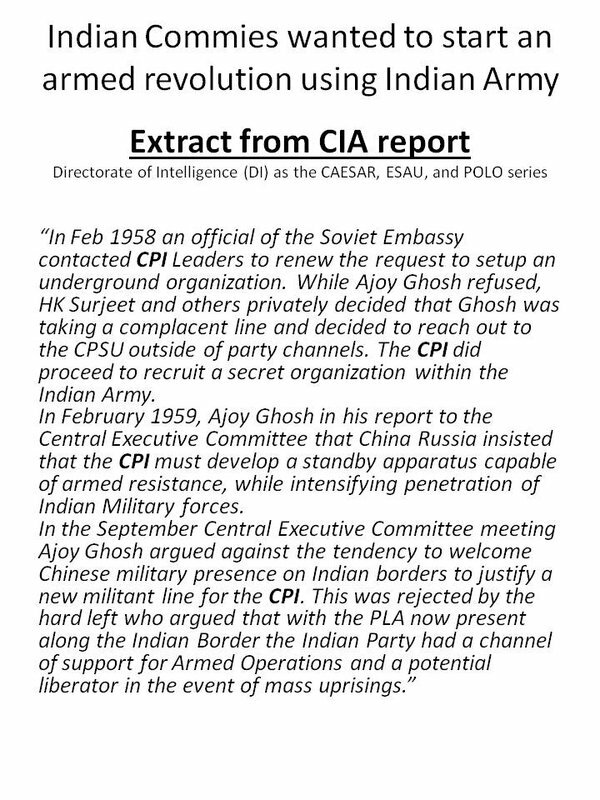 Declassified CIA reports on Indian Commies during 1962 War is damning. Dr.Ambedkar on Communists: “In another context, presiding over a District conference of the Depressed Classes at Masur in September 1937, Ambedkar declared that he was a confirmed enemy of the Communists who exploited the labourers for their political ends, and there was no possibility of joining them. Reference: Book Perfidies of Power: India in the New Millennium, by P Radhakrishnan, page 54. Why Communists opposed the Constitution? 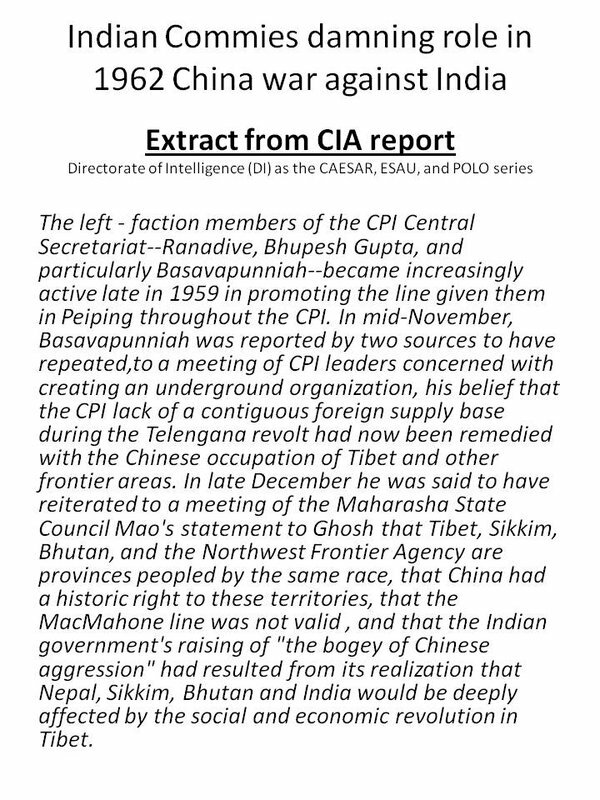 This entry was posted in Biosketch, Exclusivist religions, History, Nation, Threats and tagged 1947, 1962, Azaadi, China, China war, Communist, Communists, Communists in freedom struggle, CPI, CPI-ML, India, Muslim League, Muslims, Namboodiripad, Partition, Sitaram Yechuri on March 9, 2016 by Swadhyaaya.